James Elliott Williams (13 November 1930 – 13 October 1999) was born in Fort Mill, South Carolina and moved two months later with his parents to Darlington, South Carolina where he spent his early childhood and youth. He attended the local schools and graduated from St. John's high school. He was a sailor of the United States Navy during the 1950s and 1960s. He is, also, the most highly decorated enlisted man in the history of the U.S. Navy. In July 1947, at the age of 16, he entered the United States Navy where he served for twenty years, retiring in April 1967. During those twenty years he served in both the Korean and Vietnam War. In Vietnam, the petty officer was assigned to the River Patrol Force whose mission was to intercept Viet Cong arms shipments on the waterways of South Vietnam's Mekong Delta. On 31 October 1966, Boatswain's Mate 1st Class Williams, patrol commander for his boat, River Patrol Boat 105, and another PBR was searching for Viet Cong guerrillas operating in an isolated area of the Mekong Delta. Suddenly, Communist guerrillas manning two sampans opened fire on the Americans. When Williams and his men neutralized one boat crew, the other one escaped into a nearby canal. The PBR sailors gave chase and soon found themselves in a beehive of enemy activity as Viet Cong guerrillas opened up with rocket propelled grenades and small arms against the Americans from fortified river bank positions. Against overwhelming odds, several times Williams led his PBRs against concentrations of enemy junks and sampans. He also called for support from the heavily armed UH-1B Huey helicopters of Navy Helicopter Attack (Light) Squadron 3, the "Seawolves." When that help arrived, he kicked off another attack in the failing light, cleverly turning on his boats' searchlights to illuminate enemy forces and positions. As a result of the three-hour battle, the American naval force killed numerous Viet Cong guerrillas, destroyed over fifty vessels, and disrupted a major enemy logistic operation. BM1 Williams not only displayed great courage under fire, but a keen understanding of how his sailors, weapons, and equipment could be used to achieve victory. On 14 May 1968, President Lyndon Johnson, in the name of Congress, presented Williams the Medal of Honor. His other awards include the Navy Cross, Silver Star (with one gold award star), the Legion of Merit (with Valor Device), the Navy and Marine Corps Medal with gold star, Bronze Star Medal with two gold stars, Vietnam Cross of Gallantry with Gold Star and Palm, Navy Commendation Medal, Navy and Marine Corps Presidential Unit Citation with one service star, Purple Heart with two gold stars, Vietnam Service Medal with bronze service star, Republic of Vietnam Campaign Medal, National Defense Service Medal with bronze service star, United Nations Service Medal, Korean Service Medal with two bronze service stars, Korean Presidential Unit Citation, Korean War Service Medal, and the Navy Good Conduct Medal with four bronze service stars. Chief Petty Officer Williams retired from active service in 1967 and was employed with the Wackenhut Corporation. In 1969, he was appointed U. S. Marshal for the District of South Carolina where he served until May 1977. He was then transferred to Federal Law Enforcement Training Center, Glynco, Georgia as an instructor and National Armorer. He was called back to South Carolina in July 1979 under court appointment as U. S. Marshal for South Carolina and served in that position until April 1980. He was then transferred to U. S. Marshal service Headquarters, Washington, D. C. as Programs Manager, Health and Safety and In-District Training Officer where he served until his retirement from the U. S. Marshals Service with the grade of GS-18. He was married to the former Elaine Weaver. They had five children and seven grandchildren. He is now buried at the Florence National Cemetery in Florence, South Carolina. The Shield: Dark blue and gold are the colors traditionally associated with the U.S. Navy and represent the sea and excellence. Red is emblematic of sacrifice and valor. The gold cross formy represents the Navy Cross awarded to Williams for extraordinary heroism during operations on the Mekong River in Vietnam. The hexagon with three wavy piles reversed symbolizes the Mekong River Delta where Williams distinguished himself in so many engagements against enemy forces. The stars at the top of the shield recognize his two awards of the Silver Star. The color gold denotes excellence and honor. 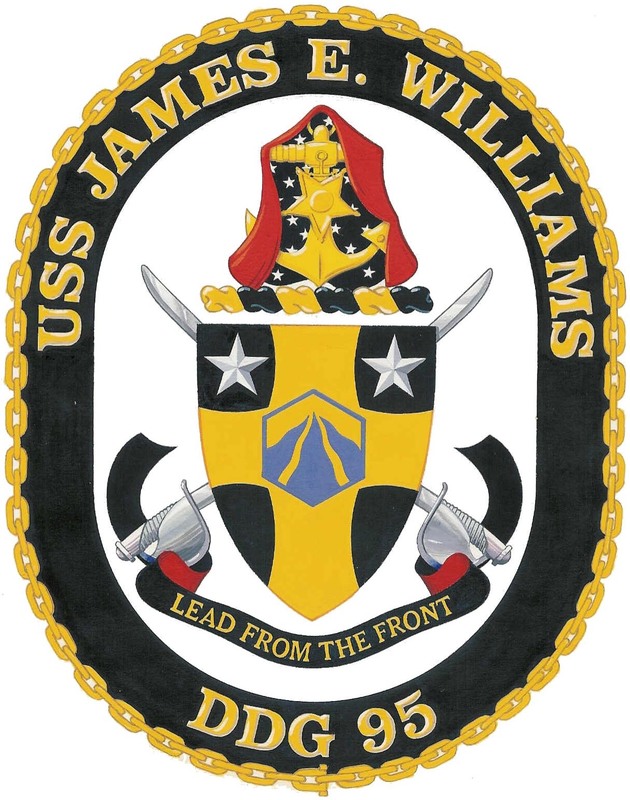 USS JAMES E. WILLIAMS' motto is “LEAD FROM THE FRONT,” a motto which embodies Petty Officer James E. Williams' tenacious fighting spirit and dignifies ship's legacy. 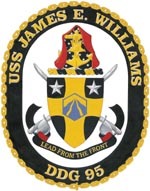 The Crest: The anchor represents the U.S. Navy and symbolizes Petty Officer Williams' rating as a Boatswain’s Mate. The mantle draped over it symbolizes sacrifice and unusual courage, recalling Williams’ demonstrated valor and leadership capabilities. A stylized Medal of Honor, the highest military decoration the United States can bestow upon a service member and awarded to Williams, is mounted upon the anchor. 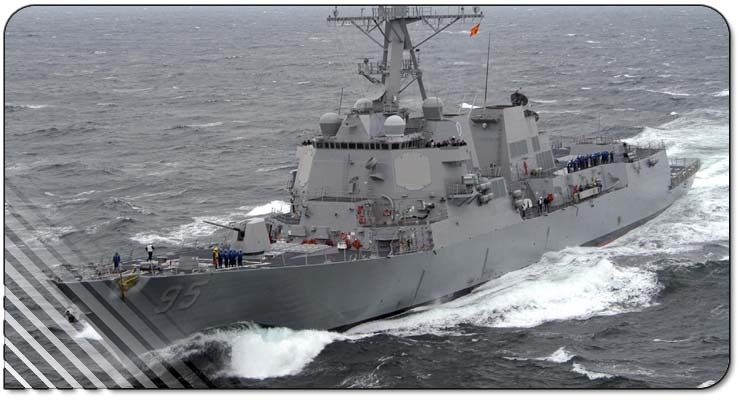 The stars upon the doubling of the mantle over the anchor reflect the numerous awards and combat achievement of Williams. The colors of the mantle refer to the United States and the national ensign. The color gold signifies excellence.